Lotteries are outlawed by some governments, while others endorse it to the extent of organizing a national or state lottery. It is common to find some degree of regulation of lottery by governments. Though lotteries were common in the United States and some other countries during the 19th century, by the beginning of the 20th century, most forms of gambling, including lotteries and sweepstakes, were illegal in the U.S. and most of Europe as well as many other countries. This remained so until well after World War II. In the 1960s casinos and lotteries began to re-appear throughout the world as a means for governments to raise revenue without raising taxes. The purchase of lottery tickets cannot be accounted for by decision models based on expected value maximization. The reason is that lottery tickets cost more than the expected gain, so one maximizing expected value should not buy lottery tickets. Yet, lottery purchases can be explained by decision models based on expected utility maximization, as the curvature of the utility function can be adjusted to capture risk-seeking behavior. More general models based on utility functions defined on things other than the lottery outcomes can also account for lottery purchase. In addition to the lottery prizes, the ticket may enable some purchasers to experience a thrill and to indulge in a fantasy of becoming wealthy. If the entertainment value (or other non-monetary value) obtained by playing is high enough for a given individual, then the purchase of a lottery ticket could represent a gain in overall utility. In such a case, the disutility of a monetary loss could be outweighed by the combined expected utility of monetary and non-monetary gain, thus making the purchase a rational decision for that individual. 7 biggest lottery jackpots in US history - "When lottery fever hits with a rising Mega Millions or Powerball jackpot, it helps to put things in perspective. Here's a look at the seven biggest jackpots in U.S. history, from smallest to largest." 11 Biggest Lottery Winners Ever: How They Planned To Spend - "What would you do if you won the Mega Millions $640 million jackpot? Here's what the people who've won past lotteries said." $560 Million Powerball Winner Can Keep Her Name Private, Judge Rules - The New York Times. $1.5bn Mega Millions lottery jackpot still unclaimed in South Carolina - "Winner of second-biggest prize ever has until 19 April." Billion-Dollar Jackpot: Engineered to Drain Your Wallet - The New York Times. Bought Mega Millions Tickets? Here’s What You Could Have Made If You Invested That Money Instead - TIME Magazine. 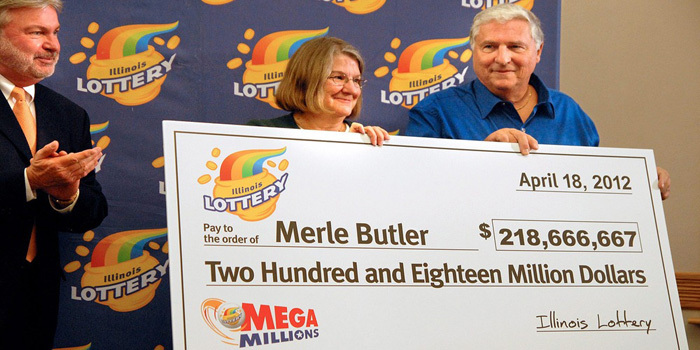 How a retired couple found lottery odds in their favor - "It was completely legal and it won them millions. Jon Wertheim reports on how Jerry Selbee and his wife Marge used 'basic arithmetic' to crack the code on certain lottery games." Hunt for owner of £76m lottery ticket bought in Boston and Skegness continues - The Independent. If You Win the Powerball Jackpot, Take the Annuity - The New York Times. Lotteries by country - Wikipedia. LOTTERY INSIDER - the lottery industry news site. "The ultimate lottery portal." LOTTERY JACKPOT RECORDS - Wikipedia. lottery post - "Lottery Post is a place for lottery players to discuss, share, and discover anything and everything about lottery games around the world. Since our humble beginnings in 2000, Lottery Post has grown to become the world's largest community of lottery players. More lottery players visit our Web site every day than any other lottery site on the Internet." ‘Million Dollar Man’ Wins Colorado Lottery For 3rd Time - CBS Denver. MUSL | MULTI-STATE LOTTERY ASSOCIATION (US) - list of US state-lotteries. Now It's the Powerball's Turn: Jackpot Rises to $750 Million After No Winner Wednesday - "No one has won the big Powerball prize, so the estimated jackpot now grows to $750 million - potentially the fourth-largest lottery jackpot in U.S. history." Numbers game - also known as the numbers racket, the policy racket, the Italian lottery, the policy game, or the daily number is an illegal lottery played mostly in poor neighborhoods in the United States, wherein a bettor attempts to pick three digits to match those that will be randomly drawn the following day. In recent years, the "number" would be the last three digits of "the handle", the amount race track bettors placed on race day at a major racetrack, published in racing journals and major newspapers in New York. Powerball & Mega Millions Are Up to $2 Billion. Here’s What to Do if You Win Both - The New York Times. Powerball drawing: Winner declared in Saturday's $559 million jackpot lottery - CNN. Powerball jackpot hits $1.3 billion - CNN Money. Powerball Winners, Beware: Good Fortune Can Trigger a Downfall - The New York Times. South Carolina winner finally comes forward to claim the $1.5 BILLION Mega Millions jackpot after staying silent for FIVE months - "But their identity remains a mystery." The Biggest Powerball Jackpot Ever: The Odds and Where the Money Goes - The New York Times. THE LOTTER - "Your Global Lottery Agent." Online lottery tickets & lottery results. US lottery jackpots surpass $1B - "Feeling lucky? Mega Millions and Powerball jackpots combined are now more than $1.2 BILLION." We Have a Winner: South Carolina Ticket Wins Record $1.6 Billion Mega Millions Jackpot - TIME Magazine. What You Simply Must Buy After You Win the Powerball Jackpot - NBC News. Who won the biggest US lottery prizes ever - "The Mega Millions jackpot is now $1.6 billion - here's who won the 5 biggest US lottery prizes ever." You can win a billion and still go bankrupt - "A winner has emerged in an enormous US lottery jackpot. But what happens to all that money and the 'lucky' ticket holder? Research suggests it’s often not what you’d expect." You won the $1.5 billion Powerball! Here's your tax bill - CNN Money. CALIFORNIA state LOTTERY - since 1984. The Lottery has a clear mission: to provide supplemental funding for public schools and colleges. CHINA WELFARE LOTTERY - "Launched in 1987, the China Welfare Lottery is one of two legal lotteries in mainland China, the other being the China Sports Lottery. Since the organisation began offering tickets for games, the China Welfare Lottery has created big prize winners and raised more than RMB310 billion for good causes, such as supporting the elderly, the disabled and the vulnerable, throughout the entire country. Every time a ticket is sold for games like 3D Lottery or Double Colour Ball, players fund their own dreams of winning huge prizes while aiding those in need." EL GORDO - the Spanish national lottery's first category. In the English-speaking media it is sometimes called El Gordo, even though that name really refers to the grand prize for all Spanish lotteries. It has been organized every year since 1812 by a branch of the Spanish Public Administration. As measured by the total prize payout, the Spanish Christmas Lottery is considered the biggest lottery worldwide. In 2017, with 165 million pre-printed 20 tickets to sell (décimos), the maximum total amount available for all prizes would be 2.31 billion (70% of ticket sales). The total prize for the first place El Gordo ("the big one") jackpot would be 720 million. Lottery outlets usually only sell tickets for one or two numbers, so the winners of the largest prizes often live in the same town or area or work for the same company. EURO MILLIONS - launched February 7, 2004. Pan-European lottery lottery that takes place once a week, on Friday evening. Whereas national lotteries are generally limited to the residents of one particular country, the Euro Millions lottery pools the stakes of the participating European countries (Austria, Belgium, Great Britain, France, Ireland, Luxembourg, Portugal, Spain & Switzerland). All prizes, including the jackpot, are tax-free (except in Switzerland) and are paid in lump sum. EUROJACKPOT - new transnational European lottery starting March 2012. Participating countries are (in alphabetical order) Denmark, Estonia, Finland, Germany, Iceland, Italy, the Netherlands, Slovenia and Sweden. The jackpot will start at 10,000,000 and can roll over up to 90,000,000. Playing EuroJackpot will cost 2 per line. The chances to win the jackpot are: 1:59,325,280. The goal is to choose the five correct numbers out of 50 plus 2 out of another 8 numbers. GERMAN LOTTO - "Lotto 6aus49 launched in 1974 and is one of Germany's biggest lottery games. The lottery is managed by the Deutscher Lotto-und Totoblock (DLTB) which represents 16 individual lotteries from various regions." LA FRANÇAISE DES JEUX - since 2009. The operator of France's national lottery games. LoterÍas y Apuestas del Estado | LAE - the Spanish national lottery game organized every year since 1812. As measured by the total prize payout, the Christmas Lottery is considered the biggest lottery worldwide. In 2006, if all of the tickets were sold, the total amount payout of prizes would be worth more than 2.142 billion (70% of ticket sales). The total amount of all prizes of the first category called El Gordo ("the big one") was 540,000,000 which was distributed among 180 winning tickets (billetes) that won 3,000,000 each. MEGA MILLIONS - since 1996. American multi-jurisdictional lottery game; it is offered in 44 states, the District of Columbia, and the U.S. Virgin Islands. Mega Millions is one of America's two big jackpot games, and the only one with Match 5 prizes up to $5 million (with the optional Megaplier). Jackpots start at $40 million and other prizes range from $2 to $1 million, or even more with the optional Megaplier! NATIONAL LOTTERY - since 1987. The state lottery of Republic of Ireland. NEW YORK LOTTERY< - since 1967. "Hey You Never Know." The third modern U.S. lottery, after Puerto Rico's began in 1934, and New Hampshire's in 1964. POWERBALL - since 1992. The number one lottery game in the United States. American lottery game sold in 44 jurisdictions as a shared jackpot game. It is coordinated by the Multi-State Lottery Association (MUSL), a non-profit organization formed by an agreement with lotteries. Powerball is a game whose advertised jackpot starts at US$20 million (annuity) and can roll into the hundreds of millions over many drawings. The jackpot is paid as a 30-payment annuity; players may choose cash instead. SPANISH CHRISTMAS LOTTERY - since 1812. As measured by the total prize payout, the Christmas Lottery is considered the biggest lottery worldwide. In 2006, if all of the tickets were sold, the total amount payout of prizes would be worth more than 2.142 billion (70% of ticket sales). The total amount of all prizes of the first category called El Gordo ("the big one") was 540,000,000 which was distributed among 180 winning tickets (billetes) that won 3,000,000 each. SUPERENALOTTO - since 1997. The Italian lottery (Europe's biggest-ever lottery prize: Saturday, August 22, 2009 - 147.807.299,08). THE UK NATIONAL LOTTERY - since 1994. The state-franchised national lottery in the United Kingdom.